Stitches and Scissors: My new bedroom set! I am finally finished with my Lotus Squared quilt. It took some time as I sent it to get quilted (my first experience doing this and it was great!) then I had to bind the huge thing. I figured out how to make some shams (just really large pillows) and made a couple of throw pillows to make a complete set. My bed is a large bed with it being a California King Size. This quilt threw a surprise at me once I washed it. It started out being 90"x 112" which was perfect with room to shrink alittle once I washed it. BUT I washed it and it ended up being 107" x 86" which was way to small on the sides. I cried for a couple of hours about it. All the time I spent making it and now it doesn't fit. I realized that this is only the second quilt that I have used cotton batting and cotton shrinks way more than polyester batting which had to be a part of it. I called my Mom (who I know I have mentioned is a sewing genius) and she mentioned that she has had to turn quilts the other way many times and that I should try that. She said it would not go all the way to the top but who cared when the shams and pillows would cover it. So my friends that is what I did and it is now perfect and there are no more tears. I really really love it. The colors are amazing. For those that are wondering I used Amy Butler's fabric line Lotus, in the blue and red color way along with Kona Cotton in Ash. 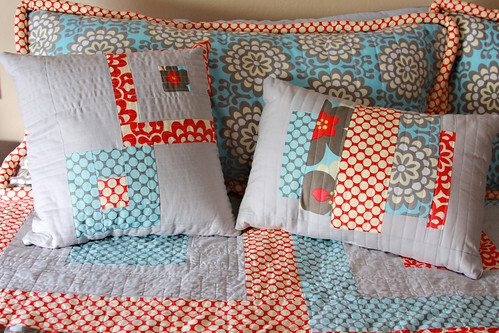 I quilted the shams and pillows since I really prefer quilted pillows more than non quilted. It is a pleasure to sleep under this quilt and I caress it everyday multiple times a day as I just love having a quilt of mine out all the time. Plus this was the largest quilt undertaking for me. I really love this! I have all of those lotus fabrics in my stash and love them so much I have not been able to cut into most of them. I don't have enough for a huge quilt, but probably a lap quilt and you've inspired me to USE them. Thanks! Oh my- it is awesome, like so so so awesome!! love the pillows too! Darci, it's gorgeous! I wish my bedroom was that cheery and bright. I love it! It is so beautiful. I really love the color combinations...just in time for cooler weather, too! Perfect. Simply gorgeous! You needn't have cried so much, this is really beautiful & looks perfect! Warm wishes from Tokyo, Japan. It's so pretty! You did a great job! 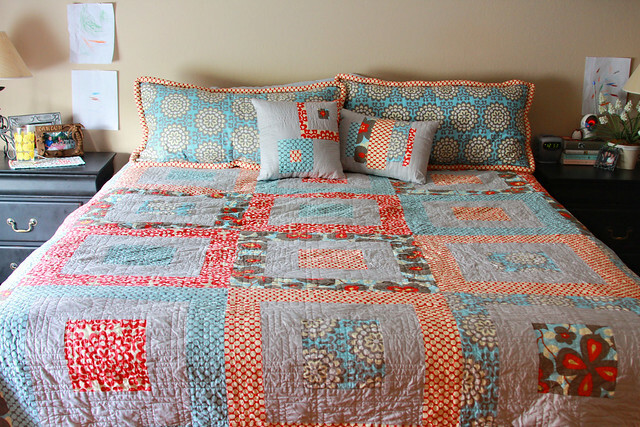 I would probably be memorized by this quilt every day and not get any housework done!!! turned out great! Looks beautiful. Good job! It looks beautiful, you did a great job! What a beautiful and complete bedroom set you made! You should be really proud of that and you should caress it a few times a day! Oh, that story made me want to cry, too! I know exactly what you mean about spending hours and hours on something and then not have it be exactly as you planned. 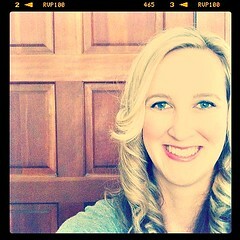 But I am so glad it has turned out okay! It sure is a BEAUTIFUL quilt, and I love your matching pillow set. Good job!! Darci, you did an amazing job! Nice to see you make a quilt for yourself. I especially love your shams. Looks amazing! So very impressive! It's lovely, lovely, lovely. That color scheme is so fresh. Way to go. 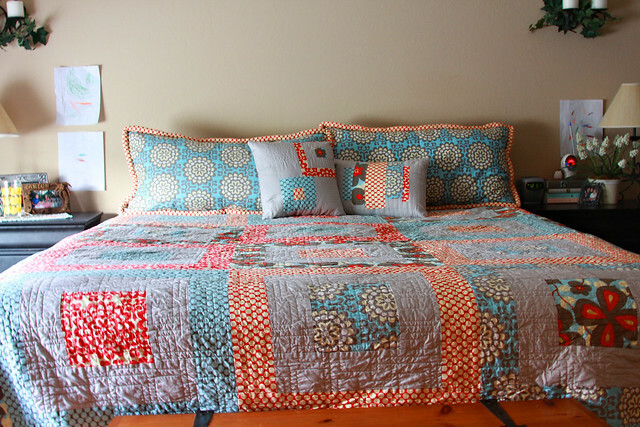 Just stumbled upon your blog- Your quilt and pillows are gorgeous!!! I love it! !